Barton Court, a stunning grade 2 listed 17th Century manor house in Kintbury, West Berkshire has been home to Terence Conran since 1971. The house dates as far back as 1690 and in it’s time has been a prep school before closing down and eventually being bought and restored by Conran. Due to the overall work that needed doing and the damage to the original character of the home, Conran was able to not only restore the rooms to his taste but also redesign without having to abide by listed building regulations. He tweaked the original features and made them more modern, adding nickel door handles instead of china and installing dimmer switch lights throughout the whole house to create more ambience from morning until night. 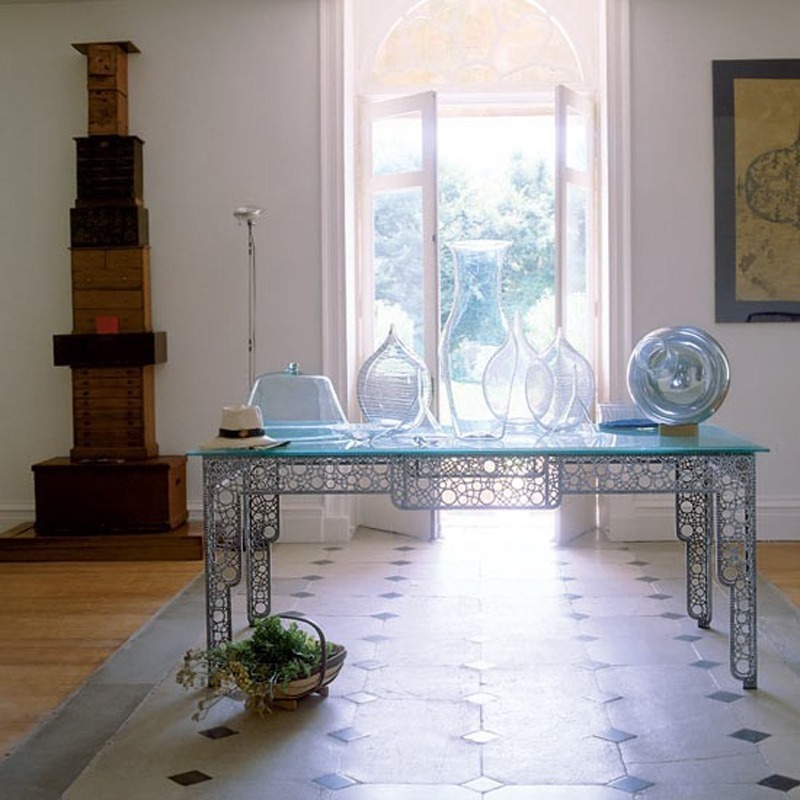 Conran’s home has become a time capsule of his work, his furniture designs and extensive glass collection can be seen all over the house. On entering the house you’re greeted with a favourite past-time of Conran’s, a stunning collection of glass vases is displayed atop a French Deco metal table bought by Conran from a Provence flea market. A stack of boxes and drawers towers against the wall, these store Conran’s collection of butterflies. The living room is light and airy with very stylish and modern furniture with a fresh white backdrop, an Achille Castiglioni Arco Floor lamp curves over a rectangular sofa, one of Conran’s own designs. Sculptured paper table lamps add accent lighting whilst an array of quirky ornaments and more glass vases create a statement wall feature. 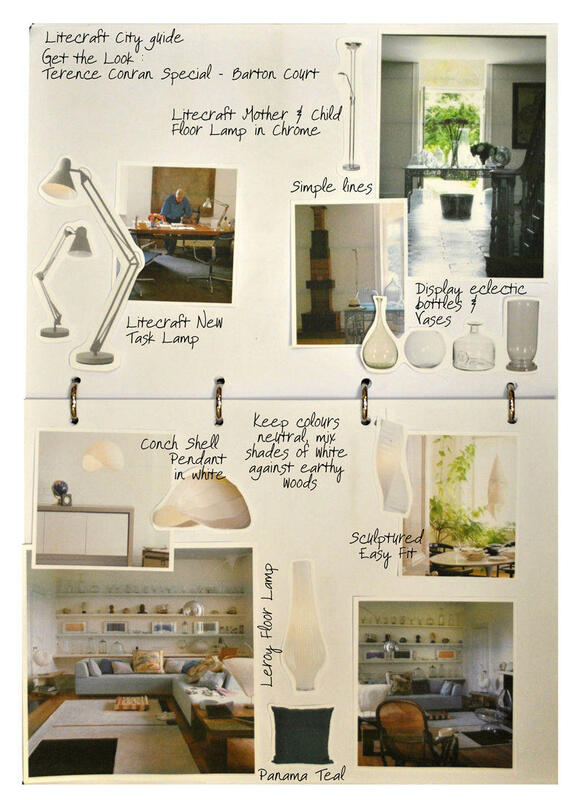 Conran’s study is again fresh and airy with white walls, large windows and shelves displaying an endless row of books, sample designs and photo-frames. 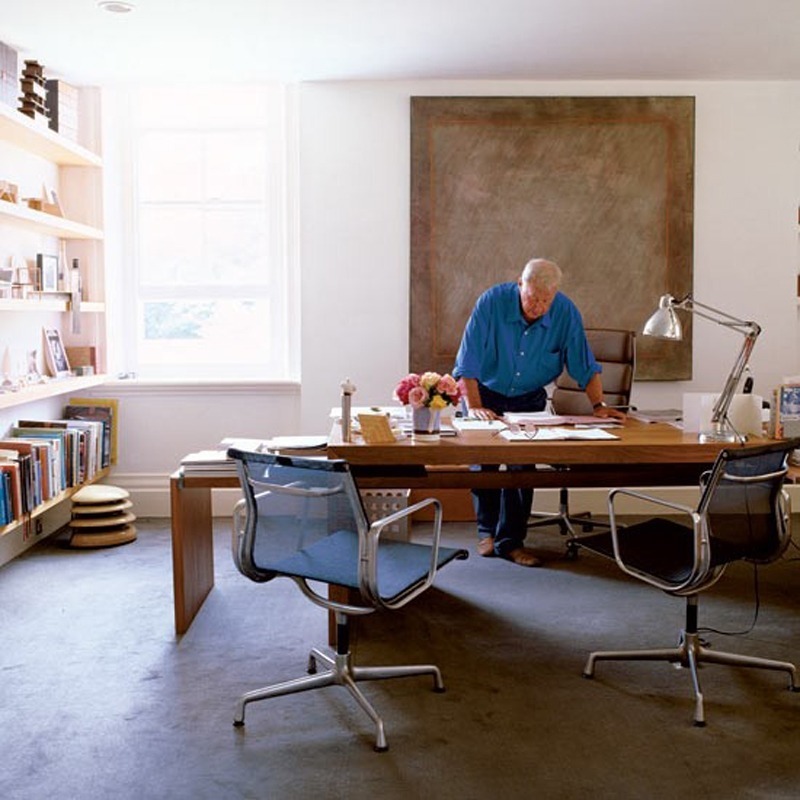 a oversized walnut wood desk takes centre stage, a one off design by Conran himself. A simple chrome angled desk lamp sits atop giving directional light over his busy desk surface. The bathroom has a de-cluttered appeal with fresh white walls and hidden storage compartments, the feel is very laid back and natural. Travertine marble shelving and units line the room whilst a cast iron bath sits opposite an open wood fire place. A collection of shaker brushes creates a feature above. Whilst keeping to simple structures there is also a hint of eccentricity in the house, a wall of restored Bugatti pedal cars lines the garage hallway. This home is stunning, showing simple lines and natural materials, to get the look of this home we’ve pulled together a simple guide to help.